Sherlock has scooped a hat-trick of awards at the star-spangled Emmys ceremony as its co-creator revealed plans for a special episode of the hit show. Benedict Cumberbatch and Martin Freeman won gongs for actor and supporting actor in a mini-series or movie for their parts as Sherlock Holmes and Dr Watson in the BBC show. The detective drama's writer, Steven Moffat, also known for his involvement in Doctor Who, picked up the award for writing in a mini-series, movie or dramatic special. He said: "We are going to start shooting a special episode in January at the same time we start shooting Doctor Who, so that will be great. "We have a plan to top it and I do think our plan is devastating and we practically reduced the cast to tears with our plan. Honestly, I think we can top it." Moffat said it has "always been tricky" to schedule Cumberbatch, whose star has risen in recent years. "It's like trying to corral a bunch of people into a cocktail party but we all know what is happening with Sherlock is unusual so we are keen to keep making it as long as it's a good show. 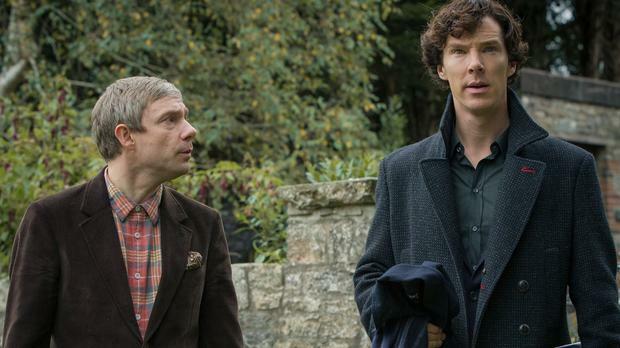 "Now Benedict and Martin are being flown in by special jet to a big leaky shed in Wales. That makes it sound terrible," he joked. Reflecting on his Emmy success, which he said he hoped would get more people watching the show, he said: "I didn't think to prepare a single word because I didn't think we could win." Moffat said the show's success - it also won four Emmys for technical achievements earlier this month - made for an unforgettable night. He said: "When we started on Sherlock, we thought it was a simple, private thing - good but not celebrated. We are still reeling from its success, and the joy it has brought so many. "We came out to LA thinking we would take nothing home but the memory of a great night - to have won seven Emmys in total is something none of us will ever forget." Ben Stephenson, controller of BBC drama, said: "It's great to see Sherlock being recognised so spectacularly at the Emmys. I'm delighted that the BBC is home to so much world-class acting and writing talent." Other winners included Fargo, which was screened on Channel 4 earlier this year and starred Freeman as the lead character. It won the Emmy for a mini-series at the event in the Nokia Theatre, Los Angeles. It was a less successful night for ITV drama Downton Abbey, which had a handful of nominations but neither Michelle Dockery, who plays Lady Mary Crawley, nor her co-stars Dame Maggie Smith, Joanne Froggatt or Jim Carter managed to win. Ricky Gervais's Derek missed out to Big Bang Theory's Jim Parsons in the lead actor in a comedy series, while Game Of Thrones actress Lena Headey, who plays Cersei Lannister in the HBO hit series, lost out to Anna Gunn, aka Skyler White, in Breaking Bad. The drug drama about a chemistry teacher-turned-meth dealer was the big winner of the night. It took honours for best drama series, and best lead and supporting actors in Bryan Cranston and Aaron Paul, fighting off Hollywood heavyweights including Kevin Spacey, Matthew McConaughey and Woody Harrelson. Collecting his award, Cranston said: "I have gratitude for everything that has happened." The show's creator, Vince Gilligan, said: "Thank you for this wonderful farewell to our show." Moira Walley-Beckett won the award for writing in a drama series for Breaking Bad. The show's finale was eagerly anticipated by fans, with many shunning social media for fear of spoilers revealing the ending. Julianna Margulies won the award for actress in a drama series for her role in The Good Wife. Cary Joji Fukunaga won the award for directing in a drama series for True Detective. The comedy series award went to Modern Family.